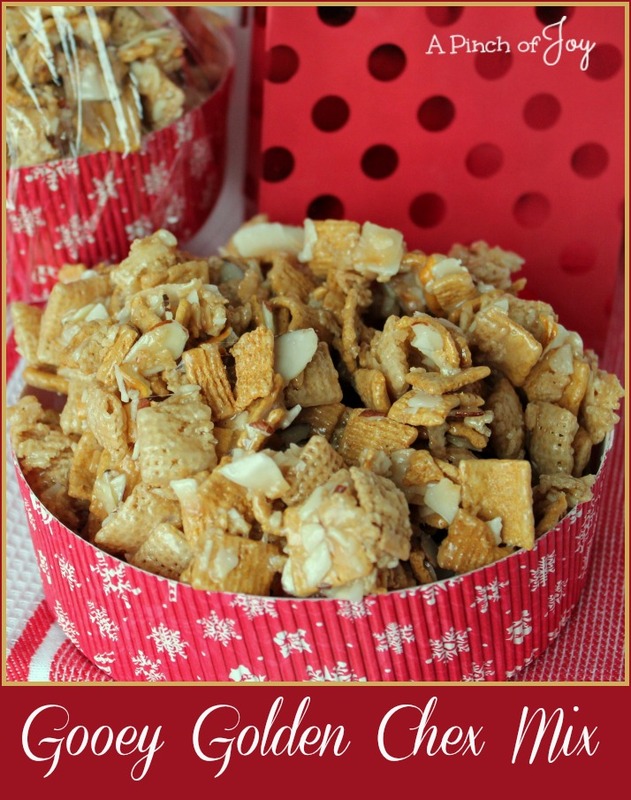 Gooey Golden Chex Mix. You can’t just have one taste. Once you start eating, it is “just one more handful” until the bowl is empty. Great stuff to package for neighbor gifts. Perfect addition to a snack buffet for any occasion. Just don’t make it too far ahead. Because — it will disappear before it becomes a gift. Just try resisting temptation by sealing this mix in gallon zip bags and putting it away. Somehow a bag always ends up back onto the counter with less in it. Cereal – that should count for breakfast, right? Trip to the kitchen for coffee – need a go with snack. Lunch time – dessert. Out the dining room door to feed the birds – just a small handful as a reward for helping little creatures. Back to the office – a small bowl won’t hurt. No wonder some folks call this Christmas Crack. You’ve been warned. 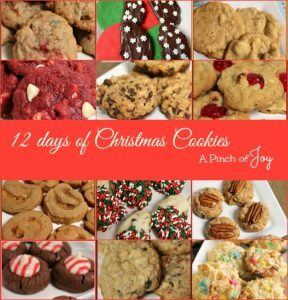 And I’m going to have to make another batch for Christmas Eve. And New Year’s Eve . . .
One of the difficulties I have with a recipe that starts with two full boxes of cereal is what container to mix it in. After some ventures that were a bit messy — I hit on the idea of using a soup / pasta pot. Once I mix all the dry ingredients together, I dump about half of it into a mixing bowl. Then I pour – very carefully – half of the hot syrup into the remaining cereal mix in the soup pot. Stir to coat. Pour the other half of the cereal mix back into the soup pot, top with the remainder of the syrup mix and stir again. This lets you distribute the syrup a little more evenly without over stirring and crushing the cereal to crumbs. Works well. You can vary the ingredients and add others. I think this would be great with nuts added– about a cup of cashews or peanuts. I found the shaved coconut on the shelf and have also seen it in the bulk section of the grocery. It’s bigger pieces than the usual shredded coconut and that lends itself well to a mix. Substitute shredded coconut, if you can’t find shaved. Chex and Golden Grahams with a few friends, coated in a not too sweet syrup. You can't eat just one bite! 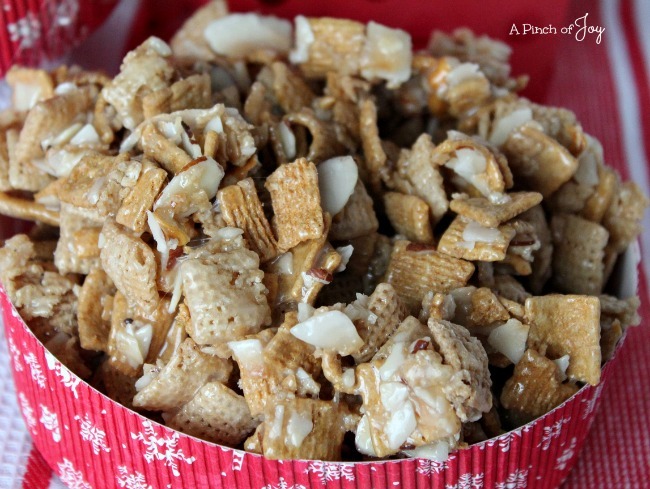 Combine cereal, pretzel, almonds, and coconut in a large mixing bowl. in large saucepan combine butter, sugar, and corn syrup and stir well. Bring to rolling boil and cook to soft ball stage OR 234 degrees on a candy thermometer. Let cool slightly. Pour mixture over cereal mix. Stir until it is well coated. Pour mixture out onto two large cookie sheets, lined with parchment paper, to cool. Stir occasionally to prevent clumping. Could you also drizzle dark chocolate over it as well? Melted dark chocolate drizzled over this sounds wonderful! The candy melts or almond bark tend to cool to a better firmness than dark chocolate chips. Now I want to make a batch and try this — great idea!